Nikon D80 Announced | OhGizmo! By Andrew Liszewski on 08/09/06 • Leave a comment! I know this is already being reported on by nearly every single gadget site on the web, but being a Nikon fan I feel obliged to also post that today they unveiled their latest pro-sumer DLSR, the D80. There’s a long list of upgrades and improvements made to the D80 when compared to the D70 including a new 10.2 megapixel CCD, a refined 11-area AF system previously only found in the high-end D2 series, a bit of a bump in terms of ISO options (now 100-1600) and a considerably larger LCD. And like the D50 the D80 uses SD cards instead of the compact flash format. 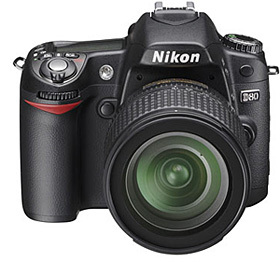 The Nikon D80 will go on sale in September starting at $999 for the body-only and $1299 including the 18-135mm DX lens. Head over to DPreview for what is probably one of the more accurate and in-depth previews of the D80 online right now.